An A-list baritone man for over three decades, Roger Rosenberg studied at Indiana University, The New England Conservatory of Music, and under the tutelage of players like Phil Woods and composers like Harold Seletsky. 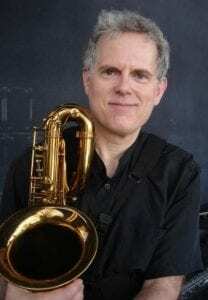 He has worked with a stunning list of greats; do the names Tito Puente, Buddy Rich, Chet Baker, Lee Konitz, Janet Lawson, Miles Davis, Quincy Jones, John Scofield, Sarah Vaughn, Gerry Mulligan, Michael Brecker, The New York Philharmonic, Thad Jones and Mel Lewis, Bob Mintzer, Eddie Palmieri, David Lahm, Tom Scott, and T.S. Monk ring a bell? Add another 40 or so heavyweight names in jazz, latin, and pop, and you’ve got a start on Roger’s resume. That Roger has been steadily in demand by the best of the best for so long is no mystery; his strong and searing solo voice combines with his powerful and swinging ensemble playing to make him a great addition to small and large sections alike. He excels at many styles of music and is a crack first-call N.Y. session player to boot. An accomplished woodwind doubler, he also plays clarinet, bass clarinet, bassoon, and flutes. His work has been acknowledged by the Downbeat critics and by an NARAS MVP award. Roger’s also a composer and leader. Mongo Santamaria’s album Amanacer, which featured Roger as composer and soloist, won a Grammy for Best Latin Album. And in 2000, Jazz Key released Roger’s first leader CD, Hang Time. Roger’s CD Baritonality — produced by Walter Becker —was released in 2009 on Sunnyside Records to great reviews. Although 2006 marked Roger’s first tour with Steely Dan, he appeared on Two Against Nature, Everything Must Go, Fagen’s Kamakiriad and Morph The Cat,Sunken Condos and Becker’s Circus Money.